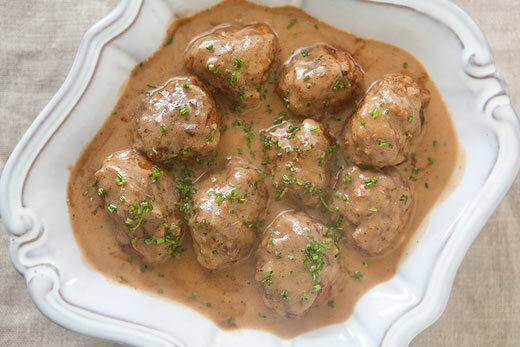 Swedish meatballs with sour cream are one of the most delicious Swedish cuisines. They are a perfect blend of meat, lemon juice, parsley and sour cream. Utensils: Cups, saucepan, spoons, frying pan and bowls. Go to the butcher and ask him to tear few marrowbones lengthwise to extract the marrow out of them for you. Get the meat and remove the fat from it. You have to make the meat balls at least an hour before cooking so that they remain in shape afterwards. Meanwhile, soak the crumbs in the cream for around five minutes and put them in a large bowl along with the meat and marrow. Chop onions, garlic and shallots in a bowl. Melt around two tablespoon of butter in a frying pan and put the chopped material in it after heating it. After moderately heating them for around five minutes, you have to put them in a bowl to mix with lemon rind, parsley, pepper, salt and thyme. Beat two eggs and put them in the bowl containing the mixture. Make the small balls in round shape gently by your hands and place them in the bowl. Now, move them round and round so that the crumbs and the material stick to them. Take a frying pan and put some oil in it. Preheat the oil and start putting the meat balls into the pan one by one. Cook them for a while and get them out when they become brown. Then, pour the sour cream on them before serving and enjoy your meal.